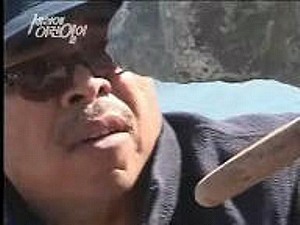 Bill Dan was featured on a lengthy segment of SBS Star Park on Korean television in 2005. Camera operators, technical staff, and media personalities came to San Francisco to interview him and film his work. Given the Buddhist traditions of that land, it is not surprising that the resulting show is both awe-struck and respectful. While the video is now only available to paid subscribers to the network's web system, the descriptive page is accessible by all visitors. It has been translated for this site through the generosity of Korean Literature scholar Charles La Shure, who has also contributed images documenting Korean rock stacking traditions. He has sought to convey the flavor of Korean media in his English rendering of the text. "The greatest of all stone towers!! There are stone towers that float in midair? Bill Dan, the stone piling master that no one can imitate! He shows us the essence of stone piling! The photographs that had the whole internet talking! Our "moment-capturing production team" rushed to the United States to uncover the secret of these magically piled stones of all shapes and colors, as if floating in midair! The man who mysteriously piles stones without using anything but his bare hands is Bill Dan! People nearby drop their jaws in amazement at seeing him lightly pile up the heavy and hard stones, as if floating in midair, and the beach is always crowded with people who have come to see these unbelievable stone towers! Bill, who is now in his eleventh year of piling stones on the beach. 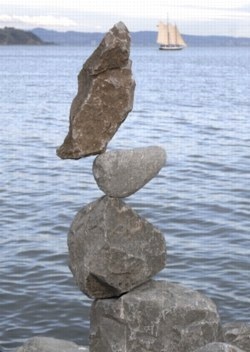 We now present Bill's amazing, thrilling essence of stone piling, which is unbelievable even when you see it with your own eyes!" The still image and original Korean text which has been translated above are used on this site by the express, gracious permission of SBS (Seoul Broadcasting Service), and are under copyright with all rights reserved. They may not be duplicated, wholly or in part, without express written permission.